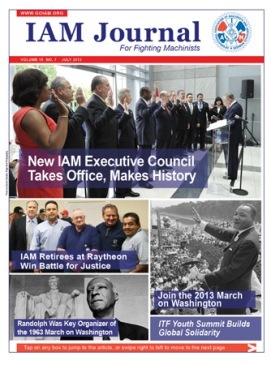 In the July issue of the IAM Journal, the most diverse Executive Council in IAM history is sworn in, the August 28, 2013 March on Washington is fast approaching, A. Philip Randolph is profiled as the key organizer of the 1963 March on Washington, the International Transport Workers’ Federation (ITF) Young Workers’ Summer School convenes at the William W. Winpisinger Center, and IAM Retirees at Raytheon win a battle for justice. Download the IAM Journal via the free IAM app on an iPhone, iPad, Android tablet, Android phone or Kindle Fire by clicking here and following the appropriate link. The IAM Journal can also be viewed online and printed in a PDF format here.